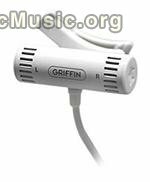 Griffin Technology today announces the Griffin Lapel Mic. This multipurpose lapel microphone offers quality stereo audio input for recording interviews, lectures and other events. An iPod equipped with the Griffin iTalk voice recorder instantly becomes a mobile recording unit. Griffin Lapel Mic features a standard 3.5mm stereo mini-jack and a swivel clip. The Griffin Lapel Mic is priced at $14.99 USD, and is available immediately.